June 7, 2016, Wheeling, W.Va. – Over $45,000 was awarded to eleven organizations in or serving Marshall County. 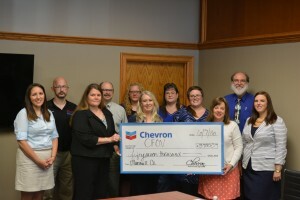 The Chevron Community Fund, a component fund of The Community Foundation for the Ohio Valley (CFOV) is a strategic grant-making program funded by Chevron and administered by CFOV. The announcement was made during an awards recognition event on June 7 at CFOV in Wheeling. Chevron is committed to improving the social and economic well-being of the communities in which they operate. Lee Ann Wainwright of Chevron stated that they are committed to supporting worthwhile projects in Marshall County which align with their funding focus areas of STEM education, workforce development and basic human needs. Since Chevron has partnered with CFOV in 2013, over $230,000 has been awarded in grants to projects in Marshall County. In addition to the grants awarded above, Chevron has also awarded The Children’s Museum of the Ohio Valley with $7,043 for their Camp Cranium program as well as the City of Benwood Police Department with $7,835 for body cameras for their officers.